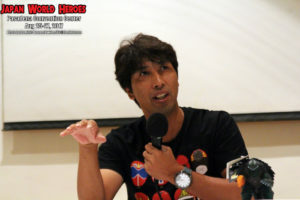 Hirofumi Fukuzawa entertains the crowds during his panel at Japan World Heroes. Photo by Dominic Tuazon. Last month, I was very lucky and happy to attend JAPAN WORLD HEROES in Pasadena, California. As we’ve mentioned on the podcast recently, this was a fantastic show dedicated to tokusatsu, with many guests from Japan directly involved with a number of tokusatsu properties. I co-moderated a panel with Jim Cirronella of Celebrity Icons in which we asked stunt and suit actor Hirofumi Fukuzawa about his career. This episode is the audio from that panel. In addition to being the suit actor for Gamera 3: Revenge of Irys (1999), Hirofumi Fukuzawa is primarily a sentai stunt actor and played rangers and heroes from a landslide of programs in Japan. Seriously, I suggest checking out his resume; it’s pretty impressive!